For anyone exploring digital opportunities, Southeast Asia should be somewhere near the top of your list; connectivity is growing at an impressive rate throughout the region, but with just 53% of its combined population online today, there's still plenty of room for further growth too. 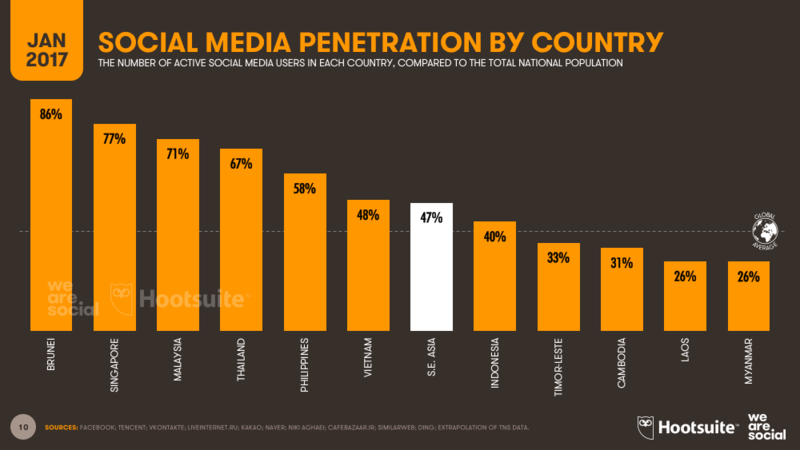 As you can see in the presentation embed above, the recent Digital in 2017: Southeast Asia report that we published in partnership with Hootsuite outlines the key stats and trends for every country across the region (click here if you'd prefer to read it in a larger format on SlideShare). I thought it might be handy to go beyond that country-level data though, and share some regional overviews too. You won't find the charts featured below in any of the Digital in 2017 presentations we've published so far though, so this is all juicy new content. 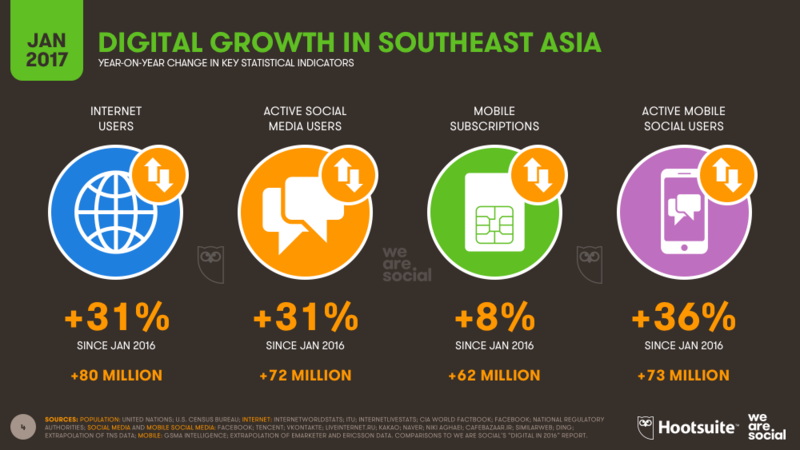 All key digital indicators grew at an impressive rate across Southeast Asia over the past year, with mobile social media use in particular posting some very impressive gains. 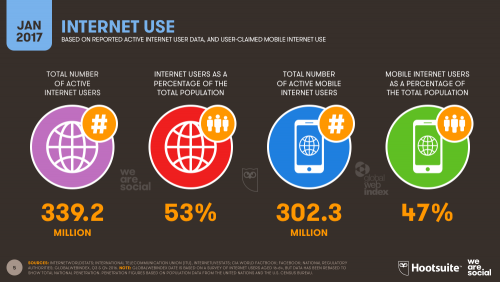 More than half of Southeast Asia's population now uses the internet, with the number of internet users around the region growing by more than 30% – or 80 million new users – in the past 12 months alone. Mobile internet use appears to be driving much of this growth, although mobile internet penetration hasn't quite hit the halfway point yet. The current pace of growth suggests that we'll likely pass that milestone in the next few months though, with most new internet users in the region now mobile-first, and often mobile-only. Given the diversity of economic development around Southeast Asia though, it's perhaps not surprising that digital connectivity isn't evenly distributed across the region's 11 countries. 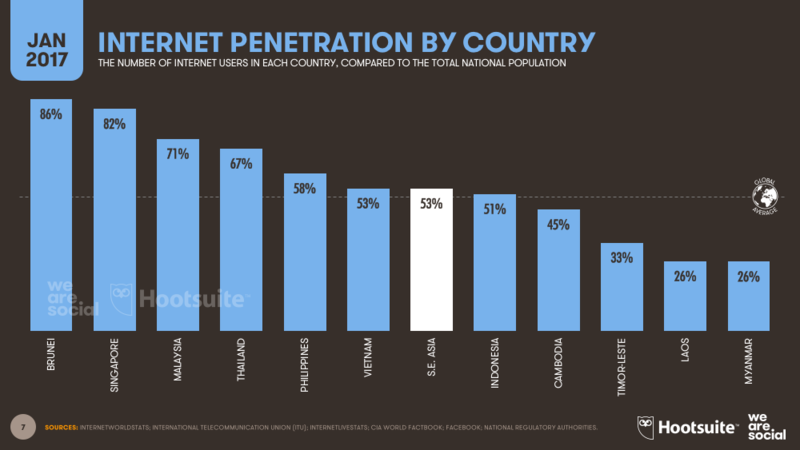 Brunei leads the region in terms of internet penetration at 86%, with Singapore close behind at 82%. At the other end of the scale, less than one-third of the local population in Laos, Myanmar and Timor-Leste has access to the internet today. However, all three of these countries posted strong growth in internet user numbers over the past 12 months, with users in Laos up an impressive 83% year-on-year versus January 2016. Cambodia – also at the lower end of the regional rankings – also posted strong growth, with internet users growing by 43% over the course of 2016 to reach 45% penetration in January 2017. 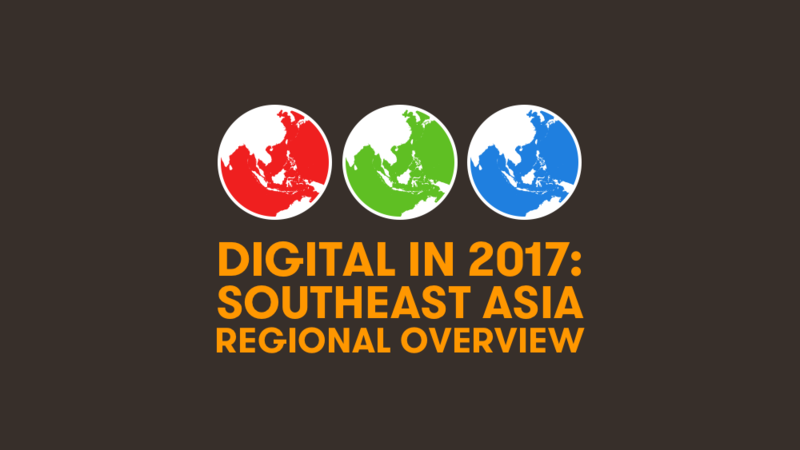 If you'd like more granular internet user data, you'll find individual country data for all 11 nations in the Digital in 2017: Southeast Asia SlideShare embed above, or you can download the full report for free by clicking here. 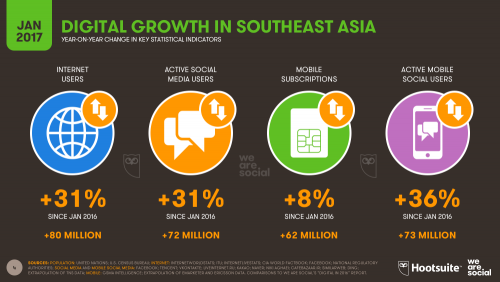 Social media users in Southeast Asia also grew by 31% over the past year, with 72 million people using social platforms for the first time in the twelve months up to January 2017. Brunei heads up the regional rankings for regional social media use, and the country sits third in the global rankings behind Qatar and the United Arab Emirates. 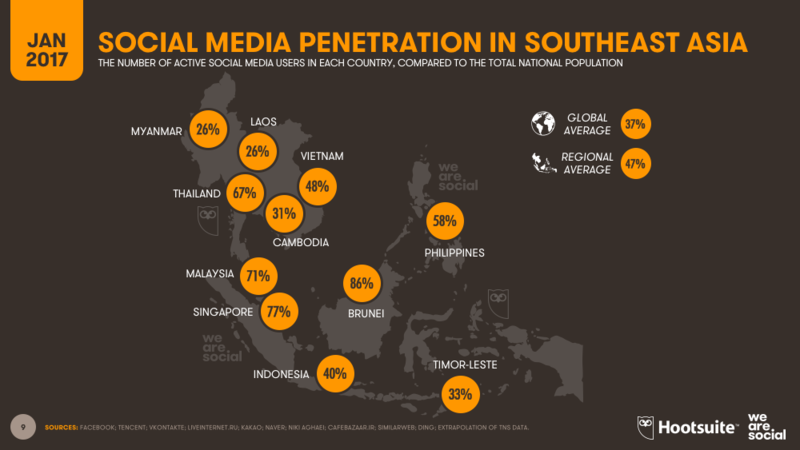 Meanwhile, more than three-quarters of Singaporeans use social media each month, but barely one-quarter of the populations of Laos and Myanmar are using social media today. 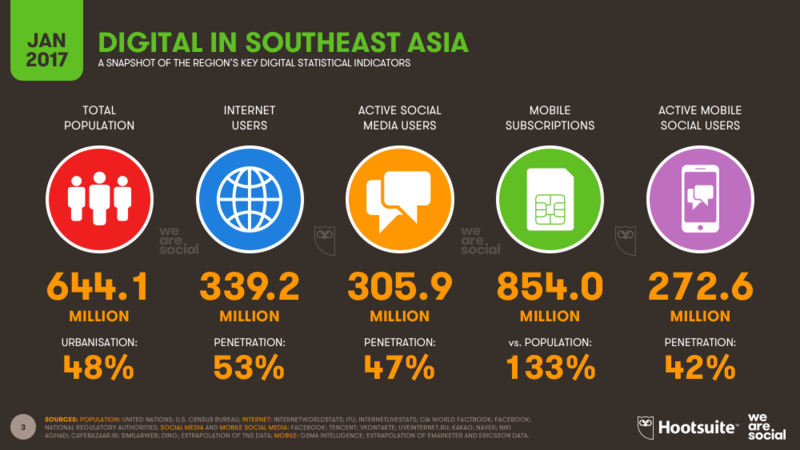 These numbers don't tell the full story in Myanmar, though; when we first started compiling our reports on digital use in Southeast Asia 5 years ago, Facebook was still blocked in Myanmar. Since these restrictions have been lifted, however, social media use has skyrocketed, to the extent that Facebook now records 14 million users in the country. 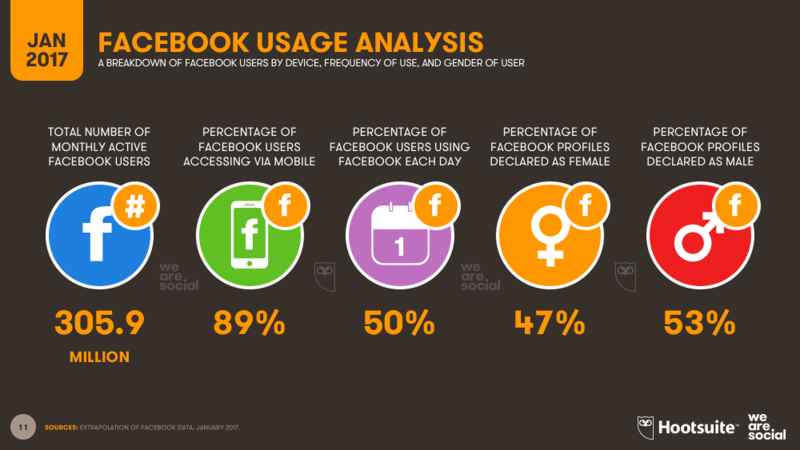 What's more, more than 6 million of these users only joined the platform in the past 12 months, delivering year-on-year growth in social media users of 84% - one of the highest growth rates in the world. Mobile social media continues to grow even more rapidly around the region too, with the number of monthly active users accessing social platforms via mobile devices up 34% year-on-year. The pattern for country-by-country mobile social numbers looks quite similar to that of social media overall, but there are some slight nuances if we compare mobile use to social use via any device. At a platform level, Facebook has the greatest number of monthly active users (MAUs) across all 11 countries in the region, but people use a wide range of platforms from country to country. 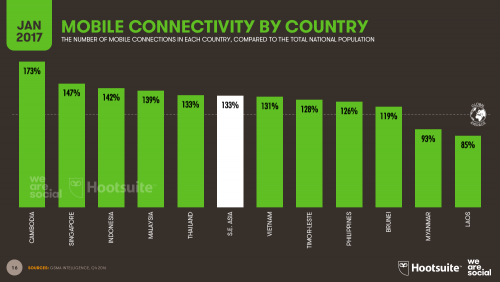 As the country-level data in our Digital in 2017: Southeast Asia data attest, mobile messengers are particularly popular around the region, although there's plenty of diversity in this area too. LINE is particularly popular in Thailand, and the country features in the platform's top 4 global markets. Indonesia also ranks in LINE's top 4 markets, but data from GlobalWebIndex suggests that the platform only sits at number 3 in the country's ranking of messengers by active users. BBM used to top Indonesia's rankings, and the country is one of the last remaining global strongholds for Blackberry's once ubiquitous messenger platform. However, GlobalWebIndex's data suggest that WhatsApp, Facebook Messenger, and LINE all now have more active users in Southeast Asia's most populous nation. This is a pattern that repeats itself elsewhere in the region, too. Viber was once so popular in the Philippines that Manila's transport authorities used it for their contact hotlines – you'll still see reference to it on the side of most buses and taxis in the city – but Facebook Messenger has since raced ahead in terms of active user numbers, with GlobalWebIndex data suggesting that Facebook Messenger is now almost twice as big as Viber in the Philippines. Zalo maintains its popularity in Vietnam, although the latest data suggest that Facebook Messenger has now edged the home-grown platform into second place in terms of monthly active users. WhatsApp leads the messenger rankings in both Singapore and Malaysia, with Facebook Messenger taking second spot, but it's interesting to note that WeChat and LINE both have meaningful user bases in these countries too. 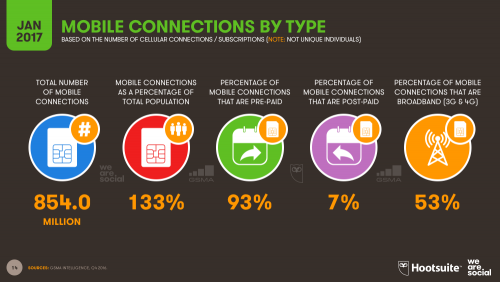 Mobiles are by far the most popular communication devices in Southeast Asia, with the number of active mobile connections across the region exceeding total population by a third. Mobile subscriptions in Southeast Asia grew well ahead of the global average, but with the number of connections already well in excess of the number of people living in the region, it's likely that many users continue to maintain more than one active SIM. Cambodia tops the regional rankings when it comes to active SIMs per head of population. This is likely caused by the specifics of the country's telecommunications infrastructure though; broadband connections are still in the minority at 45% of all subscriptions, meaning that most mobile data connections are too slow to facilitate over-the-top (OTT) messaging and VOIP services. As a result, most Cambodians continue to maintain active subscriptions with more than one mobile service provider, which allows them to take advantage of intra-network deals and bundled services. However, as broadband connectivity becomes more widely available, and as more people upgrade to smartphones, it's likely that Cambodia will experience the same evolution we've seen in other markets in the region, with individuals consolidating their mobile subscriptions to just one service provider, and moving to OTT services in place of traditional voice calls and SMS. 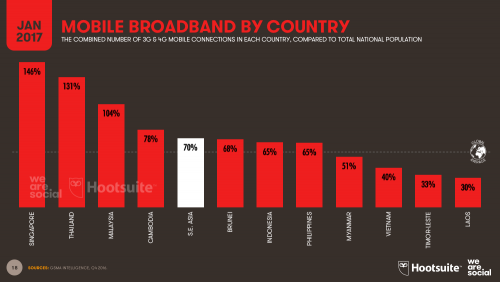 Cambodia still ranks ahead of the regional average when it comes to mobile broadband connectivity though – ahead of both Brunei and Indonesia. However, fewer than one-third of all mobile connections in Laos and Timor-Leste are 3G or faster – the definition of 'broadband' according to the GSMA's classification – although both countries posted double-digit year-on-year growth in mobile broadband penetration rates over the past twelve months. 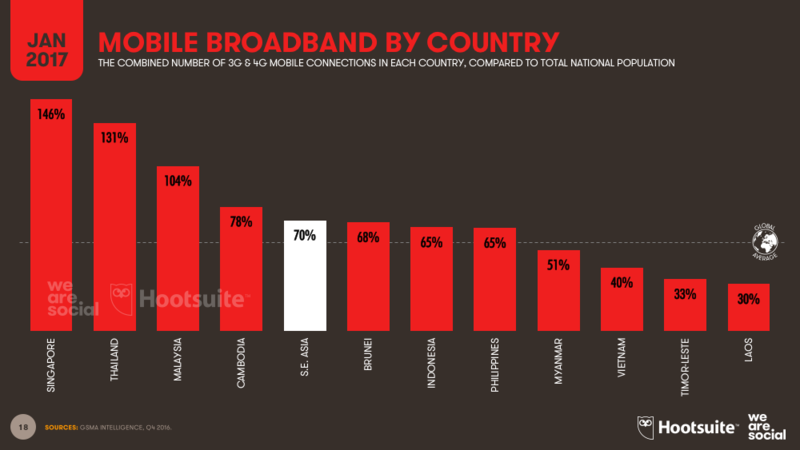 There's still plenty of room for growth in the mobile broadband market in Vietnam though, especially given the popularity of data-driven services like mobile social media: 43% of Vietnam's total population used social media via a mobile device in the past month, but barely 40% of the country's mobile connections are 3G or above. 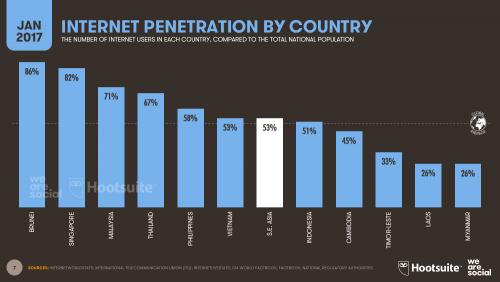 People in the Philippines face similar bandwidth challenges (although perhaps not to the same degree as Vietnam), which must cause significant frustration for users in the world's most active social media market. However, the latest data from Akamai show that the average mobile data connection in the Philippines is four times faster than the average connection in Vietnam, so things are definitely improving for Filipino mobile users. The exciting stories in Southeast Asian e-commerce are all set to come though, and the region is likely to see some particularly active growth in online shopping over the coming months. For starters, Amazon is due to launch in Singapore within the next few weeks, and whilst the nation only represents a small proportion of Southeast Asia's population, the impending launch in the island state is widely seen as a test-bed for further – and likely rapid – expansion around the rest of the region in the coming months. Amazon Singapore will undoubtedly have plenty to offer the country's many gadget fans, but Bezos's behemoth will likely cause even greater disruption to the online grocery market. Amazon will go head to head with local brand RedMart, which Alibaba recently acquired via its Lazada brand, resulting in significant competition across the sector. The ensuing rivalry will likely tigger a price war, but there's a good chance it will also promote locally oriented innovation. More specialist services like Manila-based DownToEarth, which delivers grass-fed meat, organic vegetables, and biodynamic produce direct to the Philippine capital's more upmarket homes. 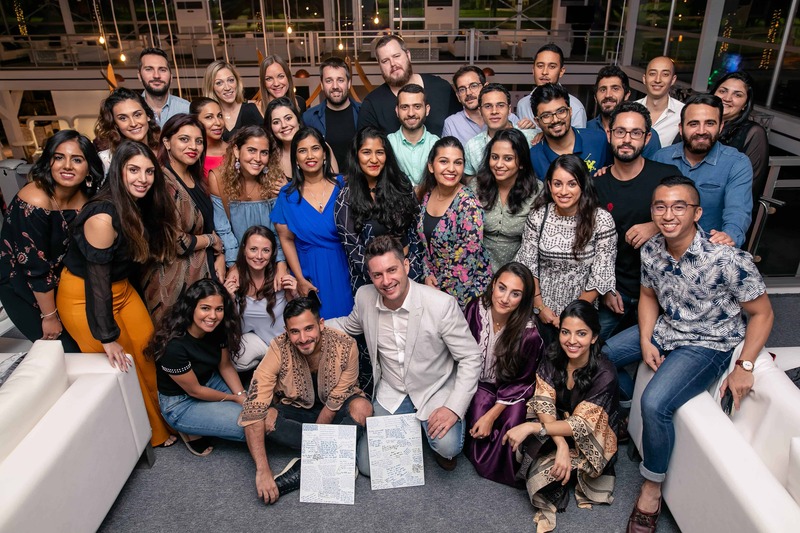 There are many more players looking to carve out their niche in this potentially lucrative market too, so keep an eye on sites like Tech In Asia and experts like TechCrunch's Jon Russell to stay up to date with the latest developments. 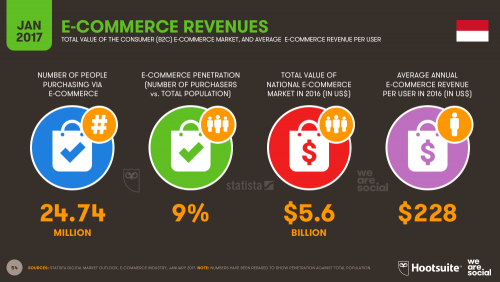 It's worth highlighting that success in e-commerce in Southeast Asia will depend on how well these retail brands can harness mobile shopping though, and m-commerce is likely to remain one of the hottest topics for startups and Southeast Asia's investment funds in 2017. So, what's next? Whilst we've already covered some impressive numbers above, all the data suggest that growth will continue to accelerate throughout the region in the coming months. The growth of integrated, mobile-centric platforms that bring a variety of connected services together into one offering. This model has already proven hugely popular – and financially successful – in China thanks to WeChat, but Tencent's integrated offering has yet to achieve any meaningful scale outside its home country. Given previous trends, it's unlikely that WeChat will be the platform to crack this integrated opportunity in Southeast Asia, but the market remains wide open for any brand that can address the nuances of Southeast Asian audiences' motivations and behaviours. New avenues for self-expression, which build on new technologies and improved connectivity to deliver the next iteration of emoji and stickers. My hunch is that these will combine live-streaming video with real-time overlays – much like Snapchat's lenses, but more attuned to the specifics of video interaction between Southeast Asian users. A significant rise in mobile payment, although it's unlikely that these services will go 'mainstream' in Southeast Asia anytime in the next 12 months. WeChat has already set the precedent for what's possible in China though, and the ability to make smaller payments via mobile devices should be particularly relevant – and appealing – to Southeast Asia's younger demographic. No brand seems to have cracked this opportunity yet though, and given the frustrations experienced by almost every bank and telco in the region who has attempted to enter this market, my prediction is that the eventual winner will likely be an outside entrant who approaches mobile payments with left-field innovation. I'll be sharing more of my thoughts on the future of connectivity here over the coming weeks and months too, so keep an eye on the We Are Social blog for more insights and provocations. 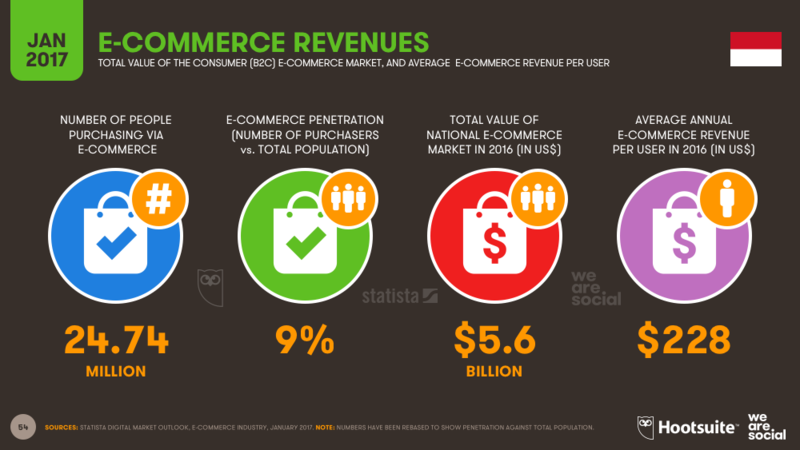 In the meantime, if you'd like to dig deeper into the data behind this post, or if you have any questions on what all this might mean for you and your business, feel free to post your questions in the comments below, or give me a shout on Twitter – you'll find me as @eskimon. This post first appeared on Tech In Asia.